01 06 WG of 01 06 1911 – Thursday evening, December 29, 1910, Mrs. William N. Hawkins died at her home, 307 West Milwaukee Street, at the close of an illness of long standing. She had been in poor health for some time and her death did not take her relatives and friends unawares. During her long illness she bore her sufferings with patience and resignation and when the final summons came she was well prepared. Mrs. Hawkins was born July 3, 1835 [1834 on tombstone], in Dublin, Ireland, and in 1848 came to Watertown. Her maiden name was Jane Smyth, she being a sister of John Smyth, West Milwaukee Street. In 1863 she was married to Mr. Hawkins, who with her two sons, George J. Hawkins of Madison and Charles E. Hawkins of New York City survive her. For several years after being married the family resided in Fond du Lac, and then removed to this city, where Mr. Hawkins for many years conducted a confectionery, ice cream and restaurant business, from which he retired a few years ago. Mrs. Hawkins was one of the best known residents of Watertown, and her large acquaintance held her in very high esteem. She possessed a kind, sympathetic disposition and during her entire life here was continually doing deeds of charity and kindness to those of our citizens not so fortunately situated as herself. Her genial, pleasant greeting to everyone made the world around her happy and cheerful, hence she is mourned sincerely by all who knew her. Monday afternoon her funeral took place from St. Paul’s Episcopal Church. The interment was in Oak Hill cemetery. William Needham Hawkins, one of Watertown's best known pioneer citizens, says The Watertown Leader, celebrated the 84th anniversary of his birth last Saturday, greeting many of his friends and old associates at the home of his son and daughter-in-law, Mr. and Mrs. George J. Hawkins, 303 West Milwaukee Street. The guests included several of the older members of the Masonic order, of which Mr. Hawkins has been a member since 1892. Friends called to greet the pioneer both afternoon and evening and wish him the return of many more anniversaries. In the afternoon and evening, the callers were Mr. Marshall Woodard and Mr. S. M. Eaton. It is an interesting fact to say that the combined ages of the three round out the figure of 252 years. In the evening, Senator William P. Voss and Hugo C. Jacobi were two more of the Brother Masons who called and paid their respects to the worthy citizen, as well as several friends and neighbors outside of the lodge. Mr. Hawkins was presented with a beautiful bouquet of chrysanthemums as a slight token of the esteem in which he is held. The life of Mr. Hawkins is an interesting one and as pure as it is interesting. He came to this country in the year 1850, when 19 years of age, coming from the city of Dublin, Ireland. He remained in New York until October, 1852, then coming to the middle west and locating at Kenosha. He removed to Watertown in 1856 and has resided here continuously with the exception of 12 years which were spent in Fond du Lac. 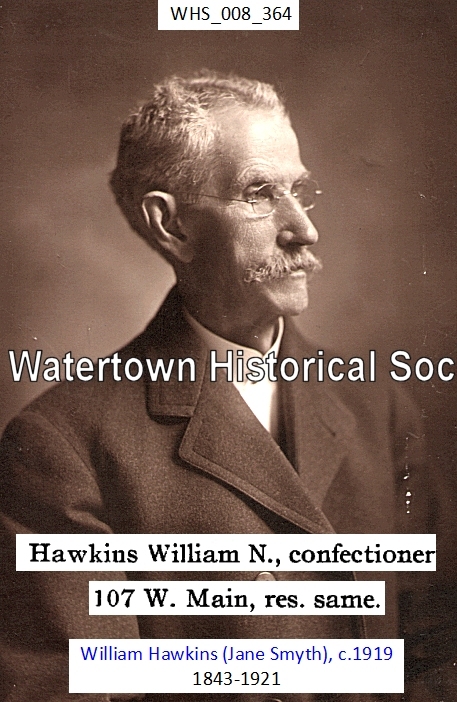 Upon returning from Fond du Lac, Mr. Hawkins engaged in the confectionery and ice cream business in which he gained an enviable reputation. He remained in that business until 1902, when he retired. Mr. Hawkins relates the interesting experience of taking passage from Liverpool to New York, which required over three months' time. Leaving Liverpool on May15th; 1850, he did not reach New York until August of the same year. This was after being shipwrecked off the coast of Newfoundland, near St. John. He also relates that it took six weeks to get from the scene of the shipwreck to New York. During his residence at Kenosha, Mr. Hawkins was a member of the pioneer fire company No. 1. He was also a member of the pioneer fire department in Watertown in the days of the old hand engines [pumper]. Mr. Hawkins has seen Wisconsin grow from a wilderness to the rich agricultural section it is today. At the time he came to the Badger state, there was not a foot of railroad within the borders of the now great commonwealth. He was obliged to make the trip from Chicago to Kenosha by boat. In those early days, farmers were to be seen driving ox teams with loads of wheat being hauled to Milwaukee, Kenosha, Racine and other lake towns, distances of 100 miles and over. George and Alice Hawkins, brother and sister came to this country in 1864 —the same year the elder brother came to Watertown from Kenosha. Both are living in Clyman Street. The sister in February next will reach the age of 86 years, while the brother George is 72 years of age. The dear old mother, Mrs. Mary Bryan Hawkins, was laid at rest in Oak Hill Cemetery. The father passed away in Ireland in 1856. The subject of this sketch was married in 1863 to Miss Jane E. Smyth of this city. Two sons are living, Charles E. of Akron, Ohio, and George J. of this city. Strauss & Sette Building Sold. Mrs. Francis G. Schwantz, one of the mortgagees, bid in the Strauss & Sette Co. building at the southwest corner of Main and Second streets last Tuesday for $13,000.